Q 2: The diagonals of a parallelogram ABCD intersect at a point E. Show that the circumcircles of triangle ABE and BCE intersect at E.
Q 3: Find the locus of the centre of circle of constant radius r, which touches a given circle of radius r1 externally. Q 4: Two circles touch each other at points A and B. 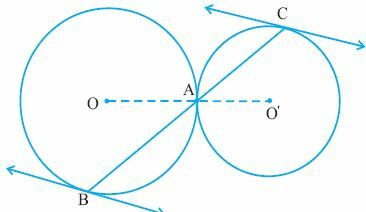 At A, tangents AP and AQ are drawn which intersect other circles at the points P and Q respectively. Prove that AB is the bisector of angle PBQ. Q 5: A circle with centre O intersects another circle with centre Ol in A and A and B passes through O. Tangent CD is drawn to the circle with sentre Ol. prove that OA is the bisector of angle CAB. Q 7: Two rays ABP and ACQ are intersected by two parallel lines in B, C, P and Q respectively.Prove that the circumcircles of triangles ABC and APQ touch each other at A.